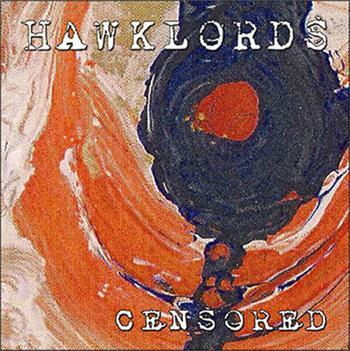 The crew of former Hawkwind members called The Hawklords, loosely knit to the original 70s Calvert/Brock led project carry on with a third outing called Censored and it is a delightful fun punky Hawk album. The CD opens with the upbeat rocker State Of Emergency which is standard from the first album, sounding very much like any old Hawklords. One track is a Michael Moorcock poem penned especially for the CD called Induction, which is a bit noodling and grim to my ears, Sonic Seven Kiss is a pseudo psychedelic punk track, while songs like the upbeat punky Catwalk Chic and the mystical Upside Down Man on the latter half of the album are stellar songs in Hawkwind style format. The bonus track You What is a delirious nightmare of a Grateful Dead LSD nightmare, very psychedelic and a little disturbing, all the snippets of conversation of “…Goodbye Sweetie”, “see ya later Mom!”, “Good morning professor Austin how are you DOING TODAY?? ?”, “This is my friend Ema!! !”, and the repeaded Jerry Richards voice going “Do you believe… that your Father never loved you….” , but I love it. It’s a tribute to Deadheads and LSD from what I gather… hehe. The concept of the album is loosely about media manipulation and censorship we seem to have with social media and in politics. We live in revolutionary times and Hawklords are definitely part of it. Here Adrian Shaw has departed on bass, after recording of the album, and Harvey Bainbridge being the only last “Hawklord” remaining. Also Jerry Richards is onboard with Ron Tree on vocals. I adored Ron’s era with Hawkwind so its nice to follow the Hawklords punky brand of music. Being the best of the three albums from these guys yet, it means anyone with a clue in Hawkwind should head out and purchase NOW!